Last Friday, I told you the markets are not often prone to lackluster movement. Whenever Nifty ends two or more expiries within a range of +2% or -2% consecutively, it often moves sharply. In the last three expiries of December 2018, and January and February 2019, Nifty ended with returns of -0.73%, 0.47% and -0.36% respectively. The last time Nifty ended three expiries in a row within a range of +2% or -2% - it ended up moving 10.33%, -7.54% and 5.43% respectively in the fourth month. This indicated chances of a big move - more than 5% - could be possible during the March expiry. Now, which way that move happens is anybody's guess. But going by price action it looked to me at first that chances of a fall were higher. Now, however, the markets have thrown a humble pie on my face, and instead rallied sharply over the last one week. The index has already moved up more than 5% from the February expiry closing level of 10,792 in a short time. Most traders who expected lackluster movement to continue and shorted calls and puts in expectation of collecting premiums were caught on the wrong foot. My Profit Hunter Pro readers were saved as I sent a timely warning that they should expect a big move ahead in March - you can see it in this piece. While I got the amplitude of the move right - I was wrong about its direction. Nevertheless, the rollover and options data indicated the tug-o-war between the bulls and bears may be entering its final stage. And 11,000 will be the crucial level which decides who wins this match. So, as soon as the Nifty broke out above the 11,000 mark on Monday, it became obvious that markets would probably head higher and move up at least 5% from the February expiry closing level of 10,792. A good trader is never married to his view or position...the moment he feels the market is moving the other way he swiftly changes his view accordingly. After the market broke out of the 11,000 mark - the opportunities just started jumping out at me. Now, before you ask let me tell you all these companies have gone through the Equitymaster research team's lens at one point or other and are fundamentally strong companies. That's not all. I have recommended one more stock which is nothing less than buying a ₹ 100 note for ₹ 50. It also enjoys a healthy dividend yield of 6%. So, there are five stocks already on my radar which are ready to move up. Apart from this, I also closed a recommendation in GE Shipping during the week with a profit of 7.54%. So, you see there's lot of action happening in the markets right now, opportunities to make up for the recent sluggish markets abound, and I am sure you wouldn't want to miss it. If you want to enjoy the action then go right ahead and join me and my subscribers to know how you can be a part of this profitable journey. 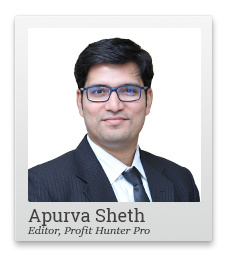 PS: Apurva's subscribers are buzzing with the excitement of 5 new trading recommendations - there's lots of opportunities to make a profit - don't be the one to miss out. Click here to join him. Equitymaster requests your view! Post a comment on "5 Fundamentally Strong Stocks to Pick for Trading Today". Click here! 2 Responses to "5 Fundamentally Strong Stocks to Pick for Trading Today"